Click the control menu and place an if block inside the forever loop. The rest of the code in this step will be up to you to design and create. Decide what will happen if the sprite gets to its goal. You can program your sprite to say, yay, you win, or do a back flip. Or even bounce around the stage. A big part of computer science is persisting through tough problems. If the first solution you try doesn't work, try again. 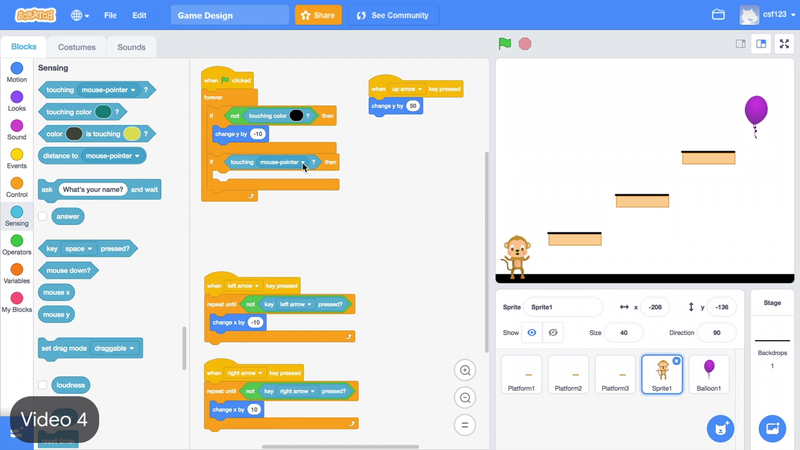 Make your CS first experience more social and fun by sharing what you created today with the Scratch Community. Before you go, hit the share button and write a description of your project so others on Scratch can enjoy it. Program an if statement for when the user wins. Then, decide how your sprite should celebrate when it wins. Once you have a winning condition that you're happy with, ask a friend to try your game. Program an "if" block to decide if the player wins the game. Add a celebration when the player sprite wins the game.